I recently wrote a review of The Complete Idiot’s Guide to Green Smoothies. I all but got on my knees and begged you to buy the book, read the book, and use the book. Well, I’m on my knees again. I was sent a few books by an author who I think of as a breath of fresh air, Kim Caldwell. The first one I read and, subsequently, will review first is the one you see pictured above, How Green Smoothies Saved My Life: A Guide for Using Green Smoothies, Uplifted Thinking, and Live Food to Enhance Your Life . I love fun books like this – books you know you’re going to get along famously with, just by looking at the cover. It was a joy to discover that the cover (bright, friendly, colorful, and fun) reflected the author beautifully. My last article about green smoothies turned out to be somewhat of a novelette, so I won’t step back up on my green smoothie soap box. I’ll let Kim Caldwell have the honors today! One of the first books of its kind to combine nutrition for the body with nutrition for the mind. Imagine vibrant health, great moods, and getting “that glow”. How to make quick and delicious nutrient packed green smoothies. Simple foods at the grocery that will charge your body with energy and life. Secrets to help you look and feel more attractive than ever before. Power words you can use to feel better now. How your thoughts affect your well-being. A common drink that will rev up your metabolism, reduce your appetite, and protect your body with a large supply of antioxidants. Tips to excellent colon health. Tips for lifting your mood and attitude. A technique that will make your skin look more youthful and radiant. Inspiring testimonies from people just like you getting wonderful results. This positive and informative book is one of those books that “read fast.” In this day and age, that’s always an asset. You’ll definitely mark certain pages to refer to as you begin (or continue) your green smoothie journey. The author includes 9 great green smoothie recipes that you’ll use again and again. You’ll also love the many “Success Stories” in the book – testimonials for green smoothies from different individuals whose lives have been changed for the better with a mere 5 minutes of preparation each day. Trust me, after you’ve enjoyed green smoothies for a few weeks, you’ll wish with all your might that you’d been drinking green smoothies since childhood! My favorite testimonial was by Kim’s own beloved grandmother, Evelyn. Evelyn (who sounds like a perfectly lovely woman to me) credits green smoothies with giving her more energy and making her feel better in every way. My favorite quote in the book (even though I loved many) is actually from Evelyn, herself. She had this to say about the effects of green smoothies: “I am finally felling like my true self.” If that doesn’t make you stop and smile, I’m not sure what would. Other success stories involved women raving about how much better their complexions are after beginning to drink green smoothies. As I mentioned in my own novelette, my hair is noticeably healthier and even thicker. When you think about it – it all makes sense, right? When we give our bodies the nutrients they need, in the manner in which they can break everything down and utilize all the “good stuff,” the inside and outside of our bodies will reward us with better health. Health is a beautiful, beautiful thing! How Green Smoothies Saved My Life – in addition to green smoothies – tells you the ins and outs of eating healthier across the board. The author explains the benefits of raw foods as well as another of my personal great passions – tea! The information is given in a simple to understand, clear manner that doesn’t leave you scratching your head or looking for the dictionary. When I read books or articles containing words that are longer than my right arm, I walk away without a lot of knowledge – plenty of aggravation, but not much knowledge. Kim Caldwell is an author who puts everything within everyone’s reach. As I made the segue from the first section of the book (Nutrition for the Body) to the second section (Nutrition for the Mind), I realized that this is truly the only way we should ever approach any course of self improvement or self growth – with our body and mind. Think about it – if one tries to go anywhere without the other, it won’t get very far! If you are serious about beginning a healthy journey, physically, you have to be mentally ready for the trip. When you begin a healthy routine such as drinking green smoothies regularly, eating healthier foods, and eliminating junk food – you will only go as far as your mind will permit you to go. If you allow negativity to creep in, it will choke the life out of your best intentions. The second part of How Green Smoothies Saved My Life gives you wonderful, wonderful, wonderful tips and guidance on keeping your mind headed in the right direction as well. Talk yourself into well being! Each of these tips (as well as others) are “fleshed out” and expounded upon. Great stuff… truly great stuff. In addition to more enlightening information about switchwords and the power of positive thought, the book lists a wonderful group of switchwords for use daily, along with the situations for each. Certain switchwords are used to attract and activate positive feelings and situations and certain switchwords are used to change or remove negative and destructive thoughts. For example, one of my favorite switchwords is CLEAR. Simply say the word when your mind entertains a negative thought or seems to be on the brink of going down a negative and destructive emotional highway. CANCEL is another switchword that’s effective for this type of stinky thinking. I can’t tell you how in love I am with these switchwords! Frankly, I’m in love with the whole book. I’m passing it around each of my daughters and I know they’ll love it as well. I hope you’ll grab a copy right away. This is a great one. 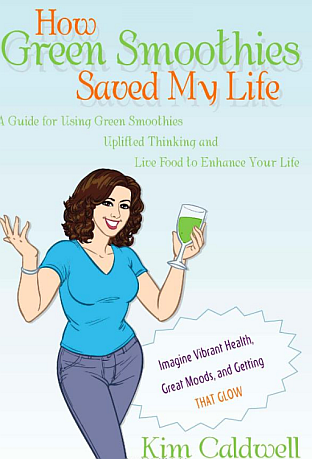 See How Green Smoothies Saved My Life: A Guide for Using Green Smoothies, Uplifted Thinking, and Live Food to Enhance Your Life for more information right away. Also See: Love reading? Live for books? I totally recommend She’s Got the Book for Fiction Book Reviews.